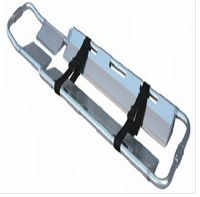 Foldable stretcher made of heavy quality extra strenght MS/Aluminium/Steel Poles. 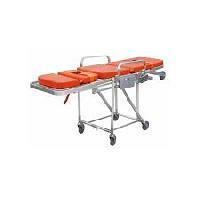 Stretcher foldable widhhwise with help of MS cross bars. 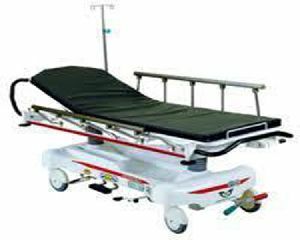 Stretcher also foldable lengthwise with the help of metal folder. 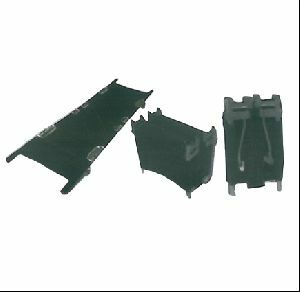 Supported on spreader MS feet. Nylon strip to provide extra strenght. Fixed height, Aluminium top & M.S. 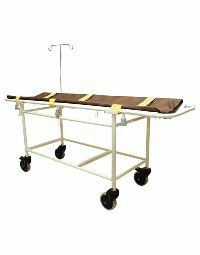 frame (Supplied with 25 mm mattress, Saline rod, Oxygen cylinder cage), Made of mild steel powder coated. With Alu. top & MS frame with 25 mm thick mattress.With 15.0 cm heavy duty castors, 2 nos. with brakes. ImageThe person who takes on the greater responsibilities will automatically gain a higher entrepreneurial spirit. 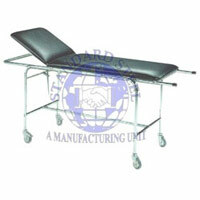 We have proved to the world and especially to the industry that there are other ways to make a stretcher. In the beginning, we already had clear ideas of what we wanted to achieve, but we did not know how to do it. 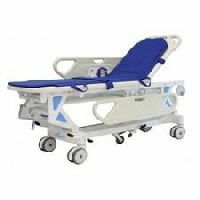 We are offering patient trolleys & stretcher. Medical equipment.